Whether you call them Samoas or Caramel Delights, chances are good that you miss munching on them since going paleo. Problem solved! Try these paleo donuts that taste just like the Girl Scout Cookies, sandwiched around paleo-friendly vanilla ice cream. These coconut cream pies are amazingly chewy and delicious with a sweet, fluffy coconut vanilla cream filling sweetened with stevia. The cookies are made with coconut cashew butter and dates for an awesome flavor, and the finished product is perfect straight out of the freezer. Lemon and coconut are a lovely flavor combination with tangy tropical flavors, and if you stuff that lemon coconut cream between two vanilla cashew butter based cookies? Now we’re talking. These are sweetened with raw honey, which goes perfectly with lemon. 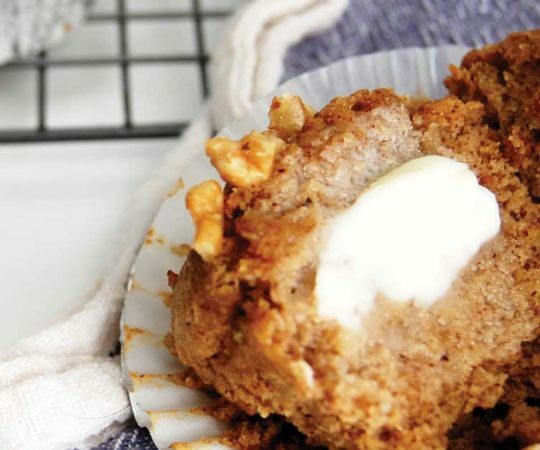 What could be better than two paleo cookies surrounding a giant chunk of homemade cookie dough? Absolutely nothing. 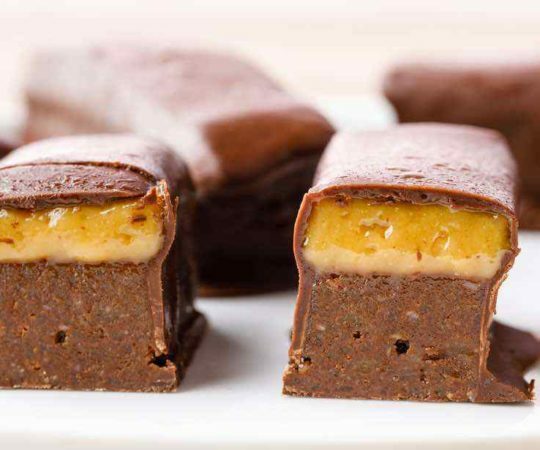 These are made with coconut flour, vanilla protein powder (use a paleo brand), sea salt, nut butter, maple syrup, and milk of choice with chocolate chips. So easy. My husband and I hail from a part of the US where whoopie pies are traditional and generally sold to you by someone who drives a horse-and-buggy. Unfortunately, they’re loaded with sugar, so we haven’t had any lately—until now! These paleo whoopie pies are double chocolate with hazelnuts. So good! Strawberries and chocolate are a classic combination, and these double chocolate cookies are the perfect vehicle for that sweet strawberry cream. You’ll need yummy ingredients like butter, honey, vanilla, strawberries, coconut milk, almond flour, and chocolate chips. These essentially taste like Nutella in sandwich cookie form, but without the soy lecithin, refined sugar, and other yuckies. You’ll need some Swerve sweetened and hazelnut oil, but the other ingredients like butter and vanilla you probably already have in your kitchen. These cookies are deliciously sweet with just coconut sugar and flavors of vanilla and cinnamon. With lots of sunflower seeds and almond flour, they’re high in protein, too! Enjoy them rolled in cinnamon and coconut sugar and sandwiched with caramel coconut ice cream. 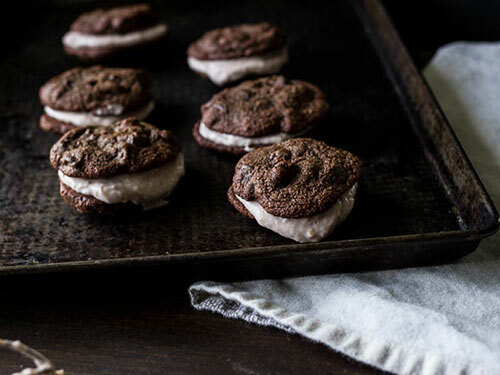 These ice cream sandwiches are made from grain-free, peanut-free “peanut butter” cookies and a molasses vanilla bean ice cream with a delicious flavor and the healthy benefits of grass-fed gelatin. 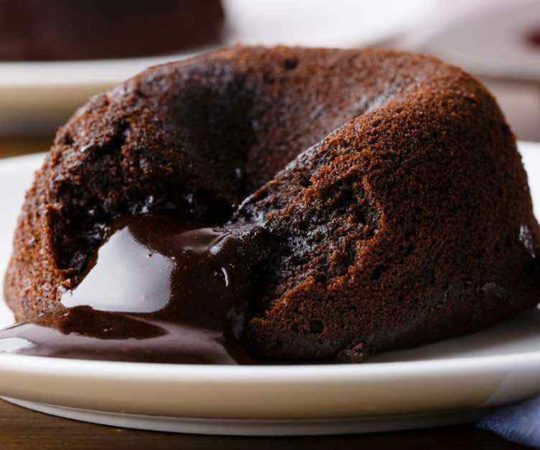 The maple syrup is the perfect sweetener to accompany the molasses flavor. 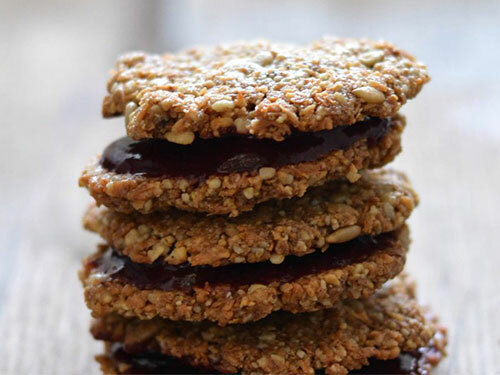 With a homemade berry vanilla chia jam, these delightful cookies are sweet and simple. 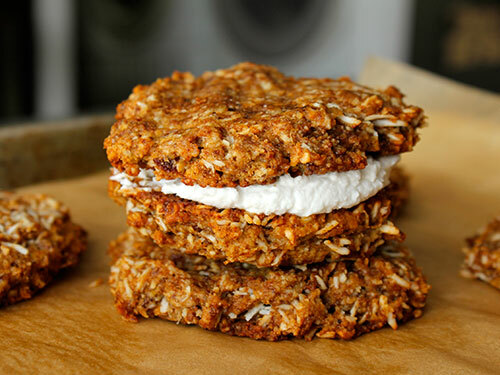 Flavors of vanilla beans, honey, and cardamom take the lead for the shredded coconut and hazelnut cookies, and you can use the leftover jam for other recipes. In this recipe, like lemon flour cookies sweetened with coconut sugar are combined with a coconut cream lemon filling for a double lemon, double amazing flavor. If you can keep them cold, these would be perfect for a spring or summer picnic dessert. Lemon curd is a perfect sandwich cookie filling because it’s thick and rich with a strong flavor that can carry milder cookies like this version, with ground almonds, tapioca flour or arrowroot, coconut oil, maple syrup, and vanilla. The lemon curd is vegan, which is a bonus for sharing with vegan friends! 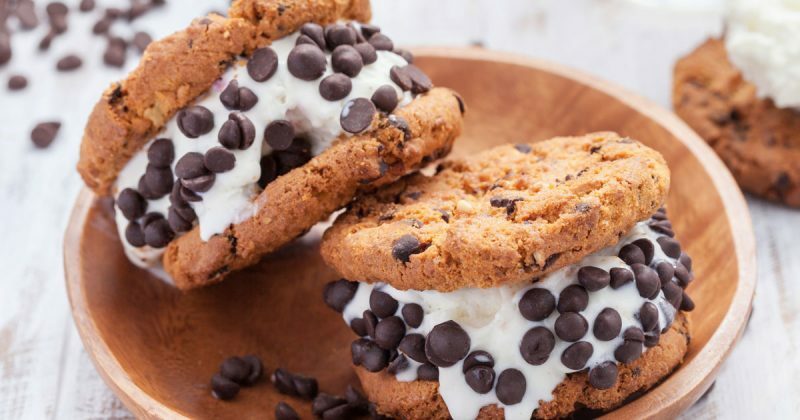 Including a recipe for the ice cream as well as the cookies, these ice cream sandwich recipe is perfect for summer and perfect for enjoying with the kids—on the porch, so they can get all messy. 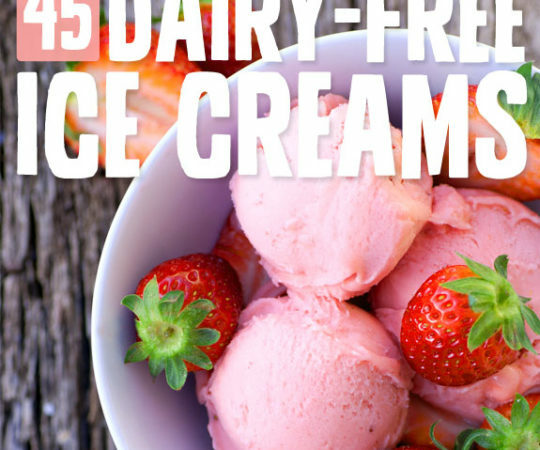 And this chocolate ice cream is made with avocado, so you know they’re getting healthy fats! 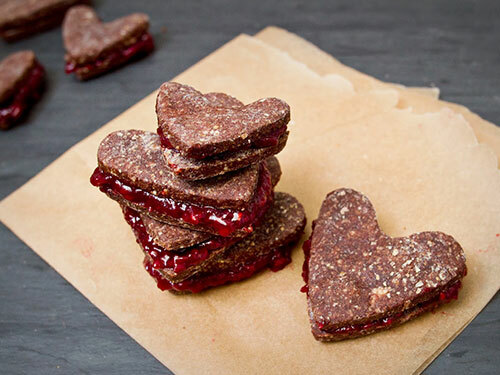 Nothing says romance like the marriage of raspberry and chocolate, and these cookies are the perfect example. Make them with dates, almond flour, coconut milk, coconut butter, vanilla, and a homemade raspberry jam sweetened with maple or honey. This recipe is for simple almond flour, honey or maple sweetened vanilla lemon cookies you can fill with the fillings of your choice. Recommended are all-fruit jams or chia jams and homemade caramel or dulce de leche, paleo-style. Rolling them in coconut sugar makes them sparkle! Double the chocolate, double the delicious cookie goodness. 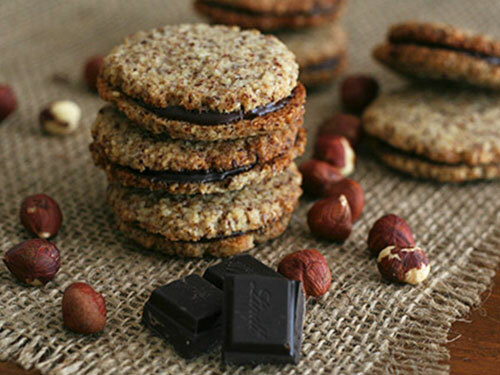 This recipe starts with homemade chocolate wafer cookies made with coconut and arrowroot flours, cocoa powder, and coconut sugar. 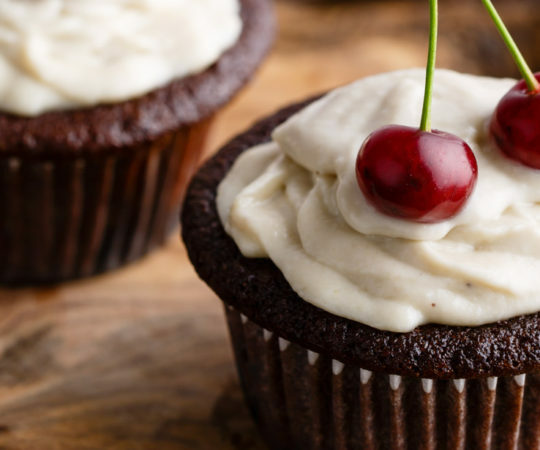 Fill them up with a chocolate cream filling made from cocoa powder, arrowroot, and maple syrup! 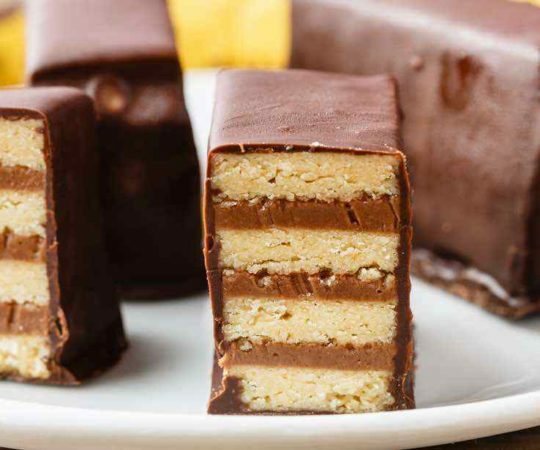 Chocolate and vanilla are a classic combo, made even more decadent with the addition of almond butter and cacao butter in the chocolate almond filling. This recipe is super simple, sweetened with raw honey and made rich with vanilla and butter.